Greens are in the lead in Maidstone according to 'Vote for Policies' survey of 400 Maidstone residents. 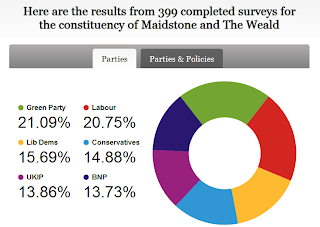 The survey shows that if personalities and parties are excluded from people's decision on how to vote then Maidstone and the Weald would have a Green MP with the Conservatives languishing in 4th place. Sadly, corporate interests ruling the media, the economy and just about every part of life, fight hard to ensure that the status quo is maintained against the will of the people. When we have democracy we will have a Green government and a bright future.